On the 21st September, BAZ-ART partnered with Capago International to create the latest addition to what now seems to be a national street art gallery in Salt River. Capago International is a exclusive representative for the processing of Schengen visa application on behalf of the French and Italian Ministry of Foreign Affairs. The mural was created to celebrate the coming together of the South African, French and Italian communities alongside the unveiling of the newly revamped Capago International offices. The mural, located on the corner of Addison and Tennyson street, is a visual reflection of the origin and the evolution of humanity and mural art. Each different artists highlighted a personal perspective to their interpretation of the word origin. 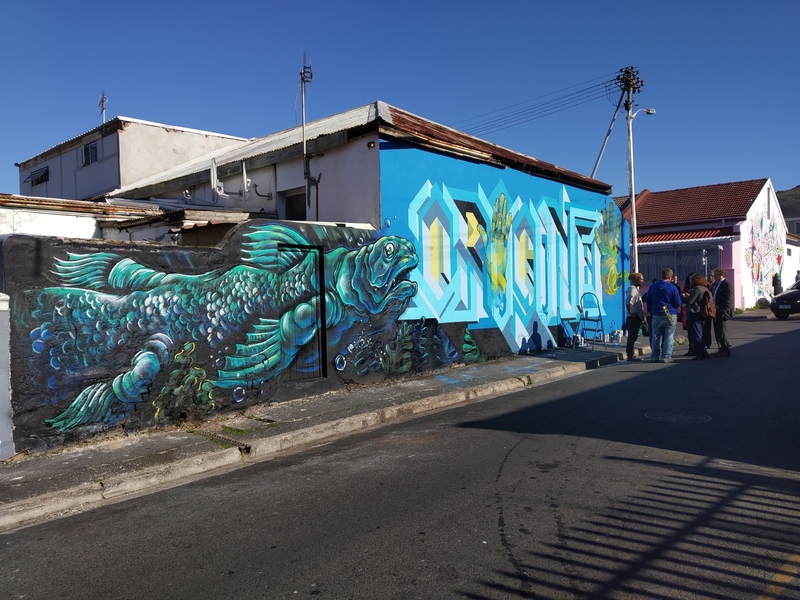 As it is speculated that the origin of graffiti can be traced back to early humanity in the cradle of mankind, we found it fitting to join forces in the Mother City to reflect upon the origin and evolution of the ever growing movement being street art. The Silex Project from France uses his influence as a street artists to bring light to evolution and primitive ancient creatures and times. For this mural, he created a prehistoric fish, Coelacanth, which is known to be one of the oldest species in the world. This species is estimated to have been on the earth for around 400+ million years. It is now considered a living fossils, having amazingly survived, unchanged, for hundreds of millions of years.Through his work, the Silex Project aims to provoke thought on imagining new human lifestyles and the effects it could have on evolution. The trio that collaborated on this piece was Orion from Italy , Mak1One from South Africa and the Silex Project from France. The lettering that spells “Origine” was created by Orion from Venice, Italy. He is well recognised for his finesse to the contemporary 3D style lettering which references old school graffiti. He uses a colourful play on geometric shapes and colour to bring life to grey landscapes. The multi coloured hands depicted in the mural was created by South Africa’s very own, Mak1One. He is one of the South African graffiti art pioneers and has been crafting since the early 90’s. The hands are distinctively from Bushman descend and was intended to embody the multicultural yet ever the same nature of man. The launch of this mural which signified the union of these three nations through art was our most internationally significant mural yet. It demonstrated our intention to create unlikely yet mutually serving relationships that extends beyond borders. From inception, we have set out to create links between artists, communities, businesses and civic society in a way that changes lives on a micro and macro level. Ambassador of France, the Consul General of France in Cape Town, the Vice-Consul of Italy in Cape, the Local Salt River Councilor among other esteemed guests. 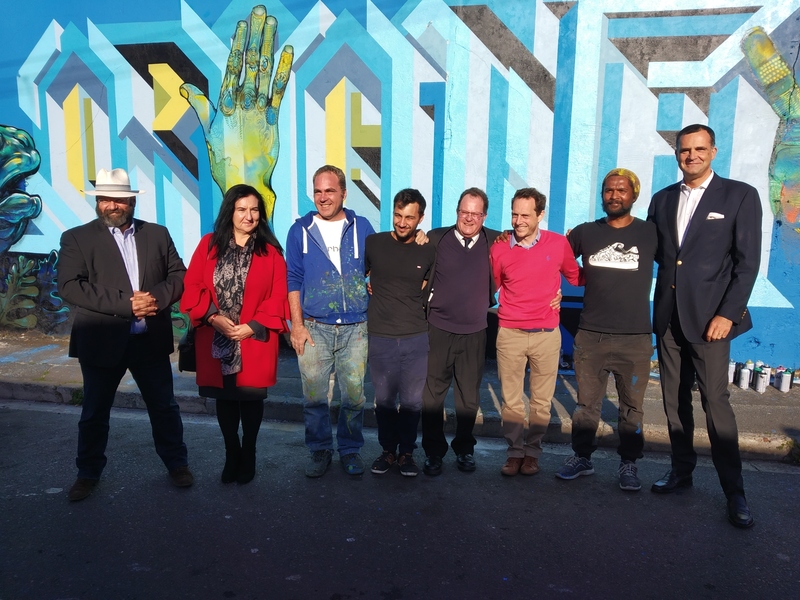 The mural launch was attended by the Ambassador of France, the Consul General of France in Cape Town, the Vice-Consul of Italy in Cape, the Local Salt River Councilor among other esteemed guests. 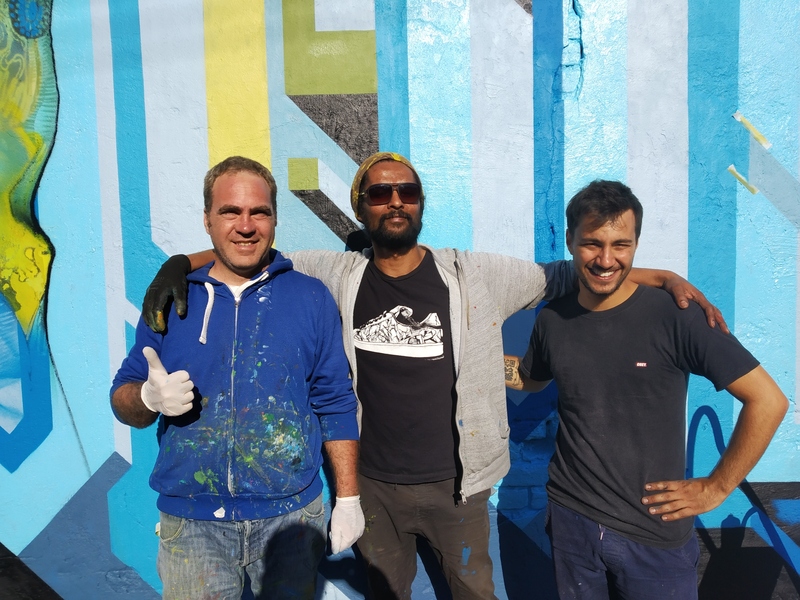 The French ambassador to South Africa, Christophe Farnaud, said the street art was not only helping to promote the Salt River area but also doing its bit for international relations. BAZ-ART is pleased to be the link that uses art to unify nations, communities and businesses. We do indeed look forward to many more of these like exchanges!